Ernie was rescued after being found cowering in a pile of leaves in the backyard of an abandoned house. Who knows how long he was out there but every rib was showing & he was starving to death. He is a very gentle & sweet dog. Whatever he went though before he came to our rescue, it made him slow to trust. Ernie has already improved greatly with his trusting of people & with gentle approaches & tenderness, he soon warms up & is a very lovable pal. He has come a long way & responds very well now since he is now being treat right & knows he won't have to go through whatever it was he went through before his rescue. 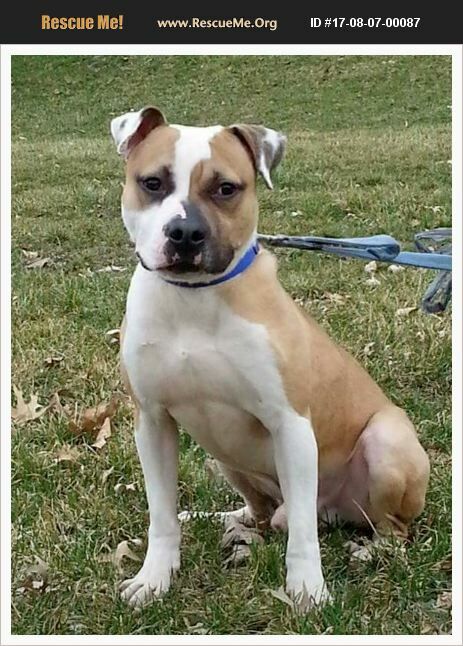 This beautiful boy will make a good, devoted companion for someone. He loves children but we recommend children 10 yrs or older. We estimate Ernie to be about 1 1/2-2 yrs old, weighs 65 lbs, is crate trained, Heartworm negative, neutered & up to date on all vaccines. Ernie needs an owner that will help build up Ernie's confidence & lead him to shine & become proud of the wonderful dog he is! Breed description is a guess by judging the physical features & coloring displayed on the dog. Only DNA testing can give the true identity of breed.